Have you ever written a short story for a language class you taught? Maybe you wanted your students to read about a particular topic, or maybe you wanted to focus on a specific grammar point but you couldn’t find any text out there to meet these needs. Like me (and the reason I’m writing this post), you felt the need to write something that would match that criteria. If you have written such a story, please join this Facebook group, Your Voice: Short stories by teachers for learners, and contact Kevin Stein. He’s got a great idea he’d love to share with you. This is how the story, Yoon Seo’s Wealth (scroll down to read), came to me. Here’s a little background on its creation. During class last Wednesday, we got to talking about quantifiers, and countable and uncountable nouns. As usual, there was a debate on the difference between much and many. Then we got wrapped up in all the different ways we could quantify the noun information. Could we use a variety, various, plenty of, tons of, abundant…? I didn’t feel prepared to go through all the different nuances, so I told the teacher-trainees I would create a lesson focused on this. At the time I wasn’t sure how I was going to approach this lesson, but the grand scheme came to me that night. My initial plan was to start our storybook creation class on Friday. This is a collaborative project I’ve been presenting for few years now (see Storybooks Written by English Teachers). It takes quite a while for the teachers to complete their books, and as a matter of scheduling, I really didn’t want to put the project off in order to do a grammar lesson on quantifiers. Then I realized I could blend the two. To introduce the project, I usually give them an example of a children’s story to analyze for character, setting, and plot creation. Then I realized if they could analyze a story which also used quantifiers, it would be the perfect blend. I put out a request on Facebook for children’s stories which focused heavily on quantifiers (a big thank you to Lee Lalka, Rose Bard and Joseph Bengivenni for the help and suggestions), but deep down, I knew I’d have to write it myself. To get started, I did some research on quantifiers with my trusty Grammar for English Language Teachers. Mr. Parrott has a handy table in his book that gives a great visual of what quantifiers work with singular, plural or uncountable nouns. I decided to borrow this idea and create my own. With this table and the children’s story genre to guide me, I spent some time brainstorming the story I wanted to tell. As a practitioner of daily gratitude (see my iTDi post, Learning Lightness Through Photography and Gratitude), I knew I could work with this topic fairly easily. So I took out my trusty notebook and started drafting some ideas. 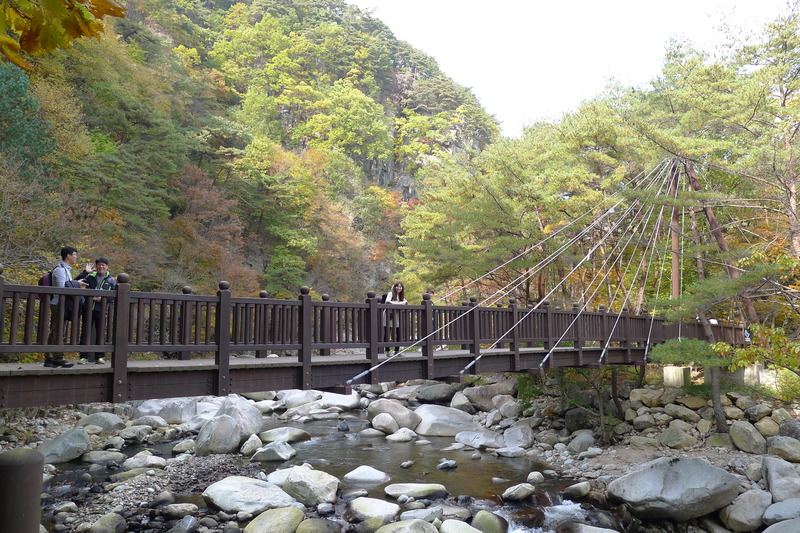 These ideas weren’t fully formed until I got back from day trip (Thursday) with the teacher-trainees to a beautiful place called Sori-gil (Sori Road) in Hapcheon. We spent the day walking along a mountain path with the magical autumn scenery to guide our way. This was the inspiration I needed for the setting of my story (and the pictures to accompany it). After a delicious bulgogi meal, I came home and put the finishing touches to the story. How did I use it in class and how did the teacher-trainees react? The next morning (Friday), I walked into class and told the teachers about my writing journey. I gave them each a copy of the story. I told them that it came to me after our last two days together. There were a few looks of surprise. I asked them if they recognized the pictures. There was a lot of smiling and nodding. Then I sat down at the front of the class as if I were a kindergarten teacher and they were my young students. It was storytelling time. I read. They listened and followed. When it was done. They clapped and smiled. I’m sure this clapping was connected to the fact that the story related to experiences we shared together: our day on Sori-gil, and our experience as writers. I told them this was my first children’s story – not a lie. Since I had written this in two days, I told them that there might be errors — not likely to be errors with quantifiers, but perhaps with the content — and that they could act as my peer review group. (In the end, I got two pertinent pieces of advice that helped me change my original story for the better). Their next task would be to find all the quantifiers I had used and find out what kind of nouns they could use them with. They would do this in groups and then fill out this table. And this is what they did. At the end I asked them what they learned. They said that they had not realized that there were so many ways to quantify nouns. I wish I could have gathered more feedback, but that will have to be left for another time. I’m curious to know if this helped or hindered their understanding of quantifiers. I encouraged them to pay attention to how quantifiers are used when they read from now on. I am also encouraging them to use a few in the stories they will write as a way of helping them internalize their use. Finally, I asked them to analyze the content of the story (characters, setting, problem, solution) using a story map, and left them with the thought that they will be writing their own stories in the weeks to come, starting this Monday. This has definitely been one of my highlights of the semester. It is wrapped up in creativity, sharing, learning and community. I look forward to seeing where this story goes from here. Feel free to use this lesson, and also make sure to let me know how it goes. There once was a girl named *Yoon Seo. 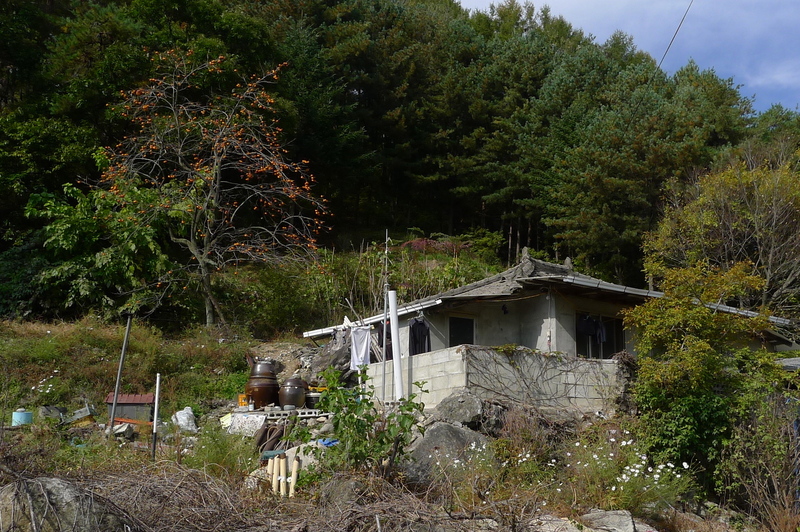 She lived in the mountains of Hapcheon along Sori Road. She lived in a very humble house with her parents and siblings. The house was small with only one room for the five of them to sleep in. In the backyard, they had a small garden and a few chickens. Yoon Seo thought they didn’t have much. She wished they had more. Ever since Yoon Seo started going to school, she always came home with sullen face. At school she realized that her family had much less money than her friends. Her friends had many more luxuries than she did. They had the best clothes and shoes money could buy. They had the best toys. What did Yoon Seo have? Yoon Seo thought she had many more problems than her friends. She felt like the unluckiest girl in Hapcheon. She felt like she had a ton of bricks on her shoulders. One day, Yoon Seo couldn’t take it anymore. She was sick and tired of the sadness she felt. 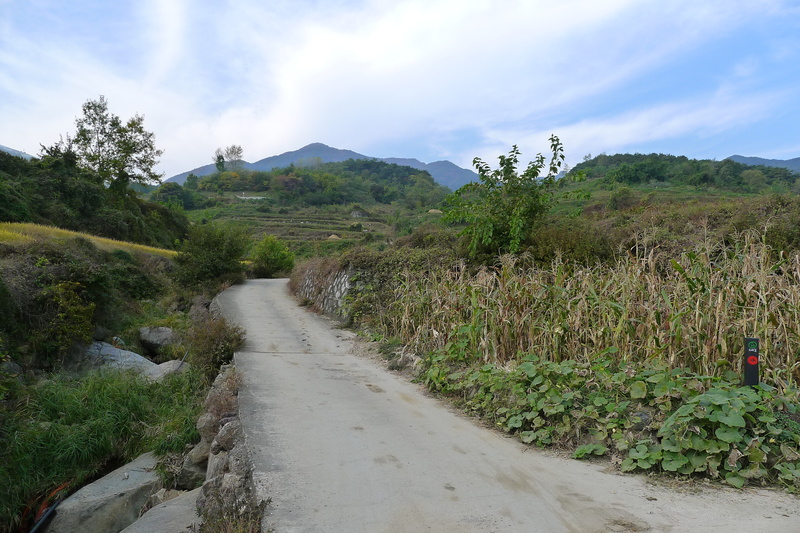 She began walking up Sori Road towards Gaya Mountain. As she walked, she came upon a herd of cows. The herd looked very content as they ate the green grass. “We have plenty of food. We have a variety of vegetables. We have plenty of apples, and persimmons. We also have a lot of rice. Actually, we have a great deal of kimchi in my mother’s pots,” Yoon Seo replied with a little surprise in her heart. She had never thought of all the food she had. She felt very lucky for all the food. Yoon Seo said goodbye to the cows and felt a little lighter than she did before. Continuing up the road, she arrived at the first bridge. Looking down on the river, she saw a school of golden fish. They looked so joyous swimming together. “How can you be so happy? You don’t have anything” she wondered out loud. “How many friends do you have?” replied the fish with the shiniest golden scales. “Hmm, I have tons of friends. Everyone in my class is my friend,” Yoon Seo answered with a little smile. She had forgotten that even though her friends had many more toys than her, they always made her feel happy. They shared everything they had. She felt lucky at that moment. Yoon Seo said goodbye to the fish and felt even lighter than she did before. Finally at the end of Sori Road, Yoon Seo looked up towards the mountain and saw a flock of blue birds flying beautifully together. They looked full of love for each other and for the sky they flew in. “How much love do you have in your life?” asked a dozen of the blue birds. “I never thought of that before. Wow, I have a huge amount of love in my life. My parents love me. My brothers and sisters love me. My friends love me. And my teachers love me,” and at that moment Yoon Seo realized what all these animals were telling her. The birds nodded their heads and Yoon Seo swore she saw a smile at their beaks. Then they flew off. When Yoon Seo looked up again, she saw a heart shape in the sky. Yoon Seo finally saw that maybe she didn’t have much money but she did have plenty of food, a lot of friends, and a great deal of love. On that day the animals helped her realize that a little gratitude creates a large amount of wealth. Not wealth in the form of money; wealth in the form of happiness. *Yoon Seo is my dear friend’s, Patty Yoon, daughter’s name. She is a baby. This is not her story. I like using the names of people in my life. It helps me connect to the story. Next Why do Korean university students look like zombies? My daughter and I just read this. She enjoyed it. One thing I would point out is that Flesch/Flesch-Kinkaid and similar can be misleading if the vocabulary hasn’t been encountered. But a wonderful teacherly project! That sounds like a great project and I am happy that I can help you out. I wrote the story because there was nothing out there that met my needs and so I am happy to help a fellow teacher meet her needs. :) I am grateful that you contacted me first. Could you email me your lesson plan or the modifications? I’ll email you shortly so you can get my address. If you don’t mind, I’m a bit curious. I’m Canadian from Nova Scotia. Where are you taking this course? I’m also curious to know how you found my story. :) Sorry for all the probing. I’m a curious person. Thank you so much for your specific and encouraging words. You help me see the story in a way I hadn’t seen it before. What I find most amazing about this whole experience is how you put a message on the “Your Voice” FB page, and that day I was visiting so that I would be prepared to link it. Life is a wonderful and mysterious thing. I am so grateful to you for giving us this platform, this voice, to share what goes on in our classrooms. You have turned something that may have been a lonely, singular moment of necessity into a public sphere of celebration. Thank you for giving so many teachers a voice. Loved it! Always an inspiration…for so many things: gratitude, peace, photography, writing, teaching, and so much more! JOSETTE!!!! such a beautiful story AND a beautiful lesson!! I can imagine the wonderful energy it generated in class – to move beyond just linguistics and into deep and personal and universal meaning…so sweet and so inspiring. Thanks!! Thank you so much for reading, sharing and commenting in such a giving way. You said it so well, “wonderful energy generated in class”. It was hard to describe, but the energy was palpable. I felt like we were all in a state of flow. I feel incredibly grateful to have such a space. Today the teachers started brainstorming their own stories. I can’t wait to see what flow comes from this. Thank you for celebrating with me! Hugs!